O #ArtMobile é um projeto de inovação social, que ensina crianças e jovens a produzir arte com uma ferramenta que está sempre presente: o telefone celular. Focado na inclusão digital, #ArtMobile é uma iniciativa sem fins lucrativos, que utiliza qualquer modelo de telefone celular para criar conteúdo digital inovador, artístico e tecnológico. Para os jovens, uma oportunidade de se expressar com o aparelho que está o tempo todo nas mãos. “Realizar esse projeto significa gerar uma nova perspectiva de futuro onde qualquer jovem pode inovar”, destaca Giuliano Chiaradia, o idealizador do #ArtMobile. O Workshop, em operação desde 2011, já passou por Dar es Salaam (Tanzânia) – Montevideo (Uruguai) -­ Casablanca (Marrocos) -­ São Paulo, Rio de Janeiro e Ceará (Brasil). Para os meses de setembro e outubro deste ano, a Set Experimental, coletivo responsável pelo projeto #ArtMobile, vai realizar novas edições na Tanzânia, Etiópia, Israel e Palestina, em parceria com as Embaixadas do Brasil nesses 4 países. O workshop, se utiliza de todos os recursos do celular para produzir vídeos, fotos, pintura digital, memes, ringtones, poemas em SMS, Apps, e até mesmo esculturas com peças e componentes de telefones reciclados. Durante a expedição pelos 4 países, vamos registrar toda a viagem em tempo real nas redes sociais, produzindo um Nano.doc, série online de 3 minutos, mostrando os bastidores dos workshops, encontros inusitados, o comportamento e a cultura desses jovens, além do conteúdo original produzido no #ArtMobile. 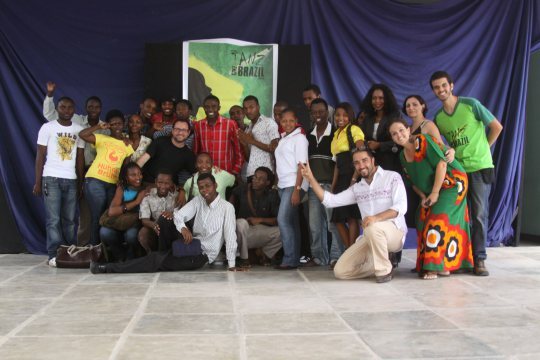 Na Tanzânia, um momento especial: vamos rever os alunos do primeiro workshop, realizado há 3 anos e retratar o legado deixado. O Projeto promove a sustentabilidade em suas ações, arrecadando telefones celulares para produção de arte, incentivando a troca de aparelhos entre alunos e reciclando material em parceria com ONGs. 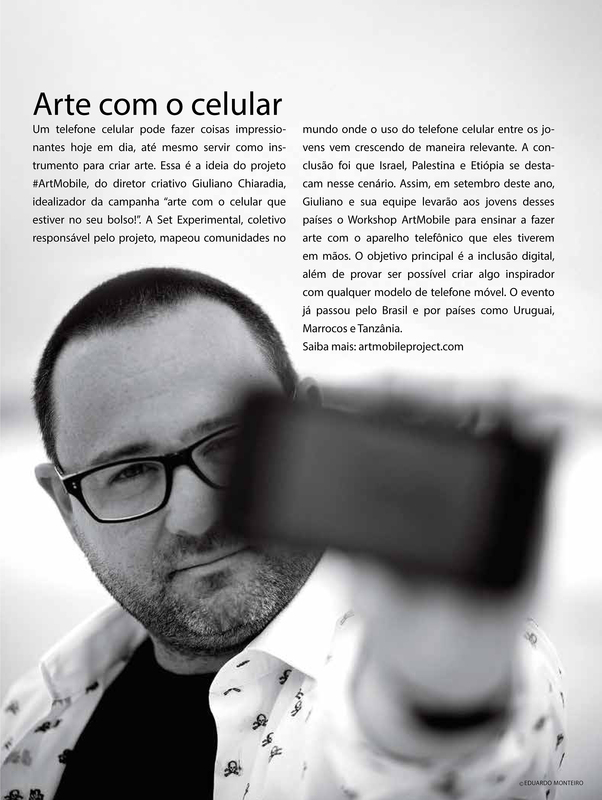 O Projeto #ArtMobile é uma iniciativa sem fins lucrativos da Set Experimental® através de seu idealizador, Giuliano Chiaradia, um dos pioneiros em novas mídias e atualmente autor e diretor da Rede Globo de Televisão. A Set Experimental é um coletivo de artistas, jornalistas, engenheiros, produtores e premiados cérebros do bem. Pioneiros na produção de conteúdo mobile na América Latina, com o curta-­metragem “Beeep”, produzido nos Estados Unidos em 2003 e os primeiros videoclipes no Brasil, para as bandas Detonautas Roque Clube, Pato Fu e cantor mais popular brasileiro, o rei Roberto Carlos no Fantástico da TV Globo. Todos os clipes foram gravados com a praticidade e imediatismo do telefone celular. Em 2012, a Set Experimental lançou o projeto 5#Calls, que se destacou no Festival de Cannes como o primeiro curta 100% mobile da história do Festival. Em seguida foi selecionado e exibido na Nova Zelândia, Colômbia, Brasil e Berlim, na Alemanha durante a Campus Party Europe. O projeto 5#Calls teve artigo publicado na Revista Vague Terrain, referência mundial de arte digital. Giuliano Chiaradia, que apresenta o Workshop #ArtMobile todo do seu telefone celular, é graduado em Inovação Digital pela cobiçada escola suéca Hyper Island, trabalhou durante 10 anos na MTV Networks e no canal a cabo Nickelodeon no Brasil e nos Estados Unidos. Essa experiência de mais de uma década trabalhando junto ao público infanto‐juvenil faz com que a linguagem do workshop seja moderna, divertida e bem familiar. The #ArtMobile is a project of social innovation, which teaches children and young people to produce art with a tool that is always present: the cell phone. 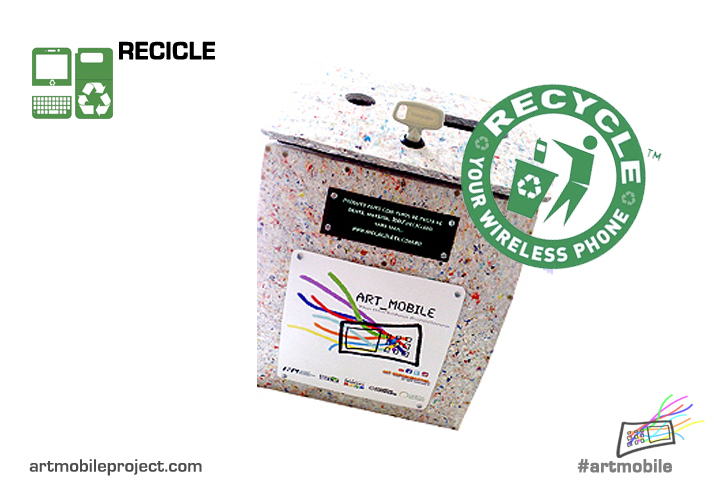 Focused on digital inclusion, #ArtMobile is a non-profit initiative which uses any cell phone model to create innovative, artistic and technological digital content. For young people an opportunity to express themselves with the equipment that is all the time in the hands. “Doing this project means generating a new future perspective where any young can innovate,” said Giuliano Chiaradia, the creator of #ArtMobile. The workshop, in operation since 2011, has had editions in Dar es Salaam (Tanzania) ‐ Montevideo (Uruguay) ‐ Casablanca (Morocco) ‐ São Paulo, Rio de Janeiro and Ceará (Brazil). For the months of September and October this year, the Experimental Set, collective #ArtMobile responsible for design, will hold new editions in Tanzania, Ethiopia, Israel and Palestine, in partnership with the Embassy of Brazil in these four countries. The workshop, using all the resources of the cell to produce videos, photographs, digital painting, memes, ringtones, poems SMS, Apps, and even sculptures with parts and components recycled phones. During the expedition in these four countries, we will record the entire trip in real time on social networks, producing a Nano.doc (online series of 3min.) 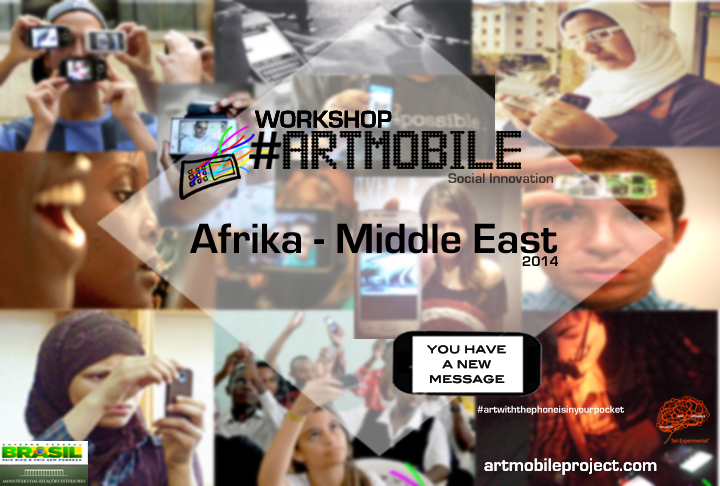 to show the making of workshops, unusual encounters, behavior and culture of these young people, and all the original content produced in #ArtMobile. In Tanzania, a special moment: let’s review the students of the first workshop, 3 years ago, and show the result of the legacy. 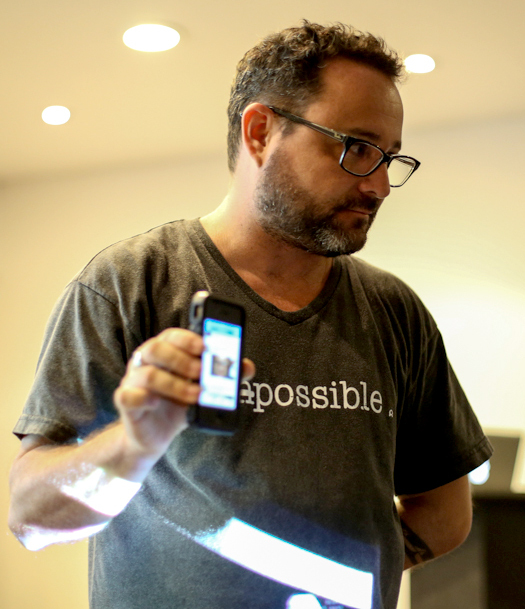 The #ArtMobile Project is an initiative nonprofit by Set Experimental®, directed by Giuliano Chiaradia, one of the pioneers in new media in Latin America and currently author and director of Globo TV Broadcast in Brazil. The Set Experimental is a collective of artists, journalists, engineers, producers and awarded brains as well. Pioneers in the mobile content in Latin America, with the short film “beeep” produced in the United States in 2003 and the first music video in Brazil, for bands Detonautas Roque Club, Pato Fu and Brazilian popular singer, King Robert Carlos in Fantastic TV Globo. All clips were recorded with the convenience and immediacy of the mobile phone. Pioneering of the new content in SMS, picture and video presented artfully on Twitter. In 2012, the project launched Experimental Set # 5 Calls, which stood at the Cannes Film Festival as the first 100% mobile short history of the Festival. Then selected and displayed in New Zealand, Colombia, Brazil and Berlin, Germany during the Campus Party Europe. The project 5#Calls had an article published in the journal Vague Terrain, a global benchmark for digital. Giuliano Chiaradia, which features all #ArtMobile Workshop from your mobile phone, is graduated in innovation for the desired Swedish school, Hyper Island and also worked for 10 years at MTV Networks and Nickelodeon cable channel in Brazil and the United States. This experience of over a decade working with the young people makes the language of the workshop modern, fun and very familiar. You have a new message on your mobile!